In a previous post, we discussed Apple’s patent filing on NFC mobile payments which relies on users having an iTunes account with a credit or debit card attached and the proposed integrated NFC chip on the iPhone pushing payments to it. While the Apple service has not seen any further exposure since the launch of iPhone 4, it does seem like a plausible bank standard based payment tool that leverage current POS technology with the risk and fraud management offloaded to banks and processors. The consumer just has to have the future iPhone with NFC. Enter Google’s proposal for mobile payments which is based around the Android Payment Chrome Extension. APCE is the software that enables merchants to process payments using Google Checkout by generating a unique QR code for each transaction that contains information about the merchant, goods in cart and connects to the merchant’s inventory. For anyone keeping score, Google’s approach is to provide all retailers with a Google hosted eCommerce store that is to be used by their employees only. 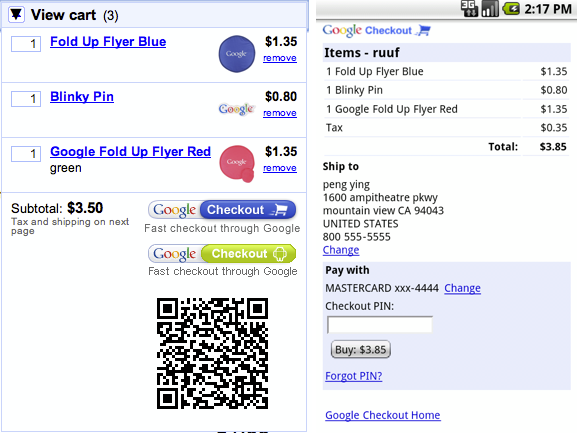 Once the transaction information is entered, the “shopping cart” is transmitted to the consumer’s phone via QR code and payment proceeds via Google Checkout. Integrate merchant inventory management process with the Android checkout process: This should be easy as a file export or DB translation from existing inventory systems. Tougher for those still using paper. Train retail personnel: Google must take this leap to move the initial adoption needle for any retailer with more than one cash register. Retail employee turnover is not a trifle to merchants and training is a huge cost. Speed the checkout: POS integration should work such that the barcode scanning of goods populates the shopping cart. If Google can make Android payment faster than cards, that would be the big win. Not sure, but it sounds like Google should be shopping for a POS software provider or manufacturer even. Google’s plan is a great start, and quite for me the direction that payments should go in order to provide consumers the most choice. Usability and merchant adoption is a tricky affair, but consider this: If I am a new retailer setting up shop for the first time, I a) likely have an ecommerce strategy b) would be happy to integrate something new because there is no switching cost c) maybe Google transaction fees are cheaper and Google Apps integration is awesome. Google, give new merchants an easy ride up to your cloud of transactions.